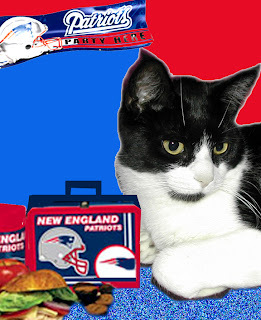 To all the cats and their beans who are wondering, we are about an hour away from Rochester NH. We live in Manchester, the biggest city in NH. A man walked into Hillary Clinton's campaign office in Rochester NH claiming to have a bomb strapped to his body and took several hostages. It drew national attention and was on most of the news channels all Friday afternoon. It ended peacefully after five hours. You can read the story here, from our local TV station. Several cats posted comments hoping we and the Devil Dog and Lucky weren't anywhere nearby, so we wanted to tell everybody we were fine. Thanks. Mom worked on my Holiday Gizzy last night. She will finish it later today. I watched. I always watch. I have been sleeping next to Mom every single night this week. It's nice. It's warm. It's comfy. I think Mom likes it too, even though she isn't used to it. She'll get over it. HEY MOM! THAT'S NOT FAIR! I am -so- happy! Lookit, a Holiday Gizzy Quilt just for ME! It is mostly red and white, and it is MINE! Mom is gonna finish it later today, but it is MINE! She didn't keep any other Christymas fabric when she made the Holiday Gizzy Quilts this summer, but she made this for me and kept it a SECRET! Now the secret is OUT and I am gonna have my very own Holiday Gizzy Quilt! Yippee! Oh shoot! Mo-----------mmmmmm! This picture makes me look FAT! I am NOT fat! It is just a terribly unflattering angle! Sheesh, Mom.... Now Monty's gonna have to spend the day in the icebox. Mom finally got smart and put the aff-gan on top of the down comforter. I like that a lot. I spent a lot of my time on the bed yesterday. Here I am watching the birdies in the bushes outside. I have amazing news. Guess where I slept last night? In my nifty bed? In the heated cat cup? On my cat hammock? No, no and no. I slept on the bed with Mom. Right next to her all night long. Labels: amazing news, where did I sleep? I dunno why Mom has such a hard time with Easy. She seems to really like Difficult. Sometimes she just doesn't get it. Anyway, here she is trying to bribe me into getting into the cat cup by putting my bedtime treats in there. She should get a grip. 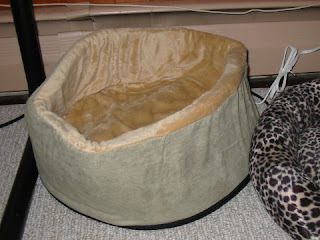 I didn't get into the spiffy bed I got as a Secret Paw present from Monty Q for about three months. Oh no. She had to make a special version. You can check them out over on her cooking blog, Cooks With Love. 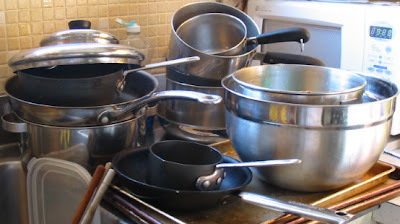 You know, when she does stuff like that, the whole kitchen goes to pot. My sweetie Monty Q has tagged me for the 7 Random Things Meme. 1. I do not like having my claws trimmed. 2. I do not like being picked up. 3. I do not like the rustle of the down comforter or of Mom's puffy pink coat. 4. I do not like tuna. 5. I do not like the heated cat cup. 6. I do not like strangers. 7. I do not like the tent Mom made me. What should I do with it? It has been cold outside, and I won't sleep in the heated cat cup. I do like sleeping on this green aff-gan that Mom has on her bed. So now, instead of making her bed every morning, Mom fixes the puffy down comforter into a nest for me. 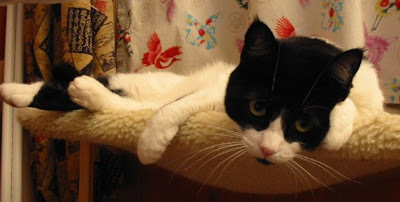 It is very warm, and when the sun leaves the cat hammock, I come to sleep here. It is where she finds me when she comes back from her day hunting gig. It's one of the little pleasures of life. I got turkey yesterday, when Mom came home. It was -yummy-! 1. Life. I am thankful for being alive. 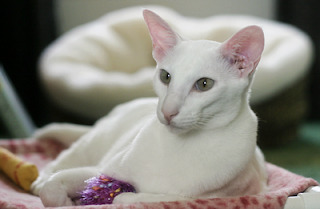 I had been hit by a car, and would surely have died had Malcolm not rescued me. 2. Food. I have access to good food and fresh water each day. Feral cats do not. Even some beans don't have that. 3. Shelter. It's nice to have a safe place. It's even nicer when it is warm and dry and away from the elements. 4. Medical Care. 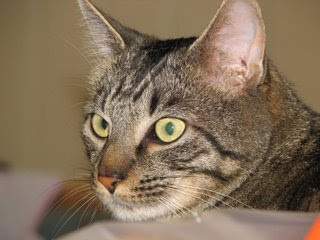 Even though us cats hate the v-e-t visits, they keep us healthy with immunizations and medicine. In many cases, the v-e-t-s are lifesavers; they saved Chance, Lilly Lu, and many others, including me. 5. Comfort. I am thankful that I have Mom to give me pets and scritches when I want. Last night, for example, she came home from her day hunting and lay down on her bed near me. I snuggled next to her and she petted me to my heart's content. I purred and purred and purred. 6. Love. Mom doesn't just give me what I -need- she gives me extra stuff just because she loves me. I have a beautiful Gizzy Quilt, I have toys, I have a heated cat cup, I get treats. 7. Family. I am a member of a loving extended family that includes Mom & Mr Karate, Mimmay & Pippay, the Karate Lady, Mr Big & Little Mr Big (aka the Boy). Family members love you no matter what. 8. Friends. When I came to live here, there were two older geezer cats, Gizzy and Jasmine. Gizzy became my dearest friend. Now I have many friends. Even, -gasp- some woofies! 9. Play. I am lucky enough to have fun toys to play with. It sure does make life interesting. 10. Meaningful Work. I have the very important job of doing Quality Assurance on each and every Gizzy Quilt that Mom makes. I love my job. 11. Blogging. Never in a squillion years would I have ever imagined I would have friends all over the world! It wouldn't have happened without my very own blog. I love sharing my stories with you, and reading yours. 12. The Cat Blogosphere. The cats and their beans in the blogosphere are the most thoughtful, caring, considerate, helpful creatures on the planet, and I am proud to be a member. Together we have helped save lives, raised money for an injured babybean and had a lot of fun. 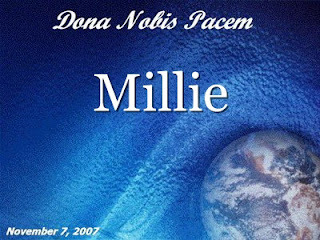 Mom and I are very thankful for the outpouring of sympathy we received when Gizzy and Jasmine each went to the Rainbow Bridge this year. There will be no turkey here tomorrow. It will be at Mimmay and Pippay's. I will be spending the day by myself. Imagine! The Cat Blogosphere calendar arrived! Have you ordered yours yet? You know you're a real blogger when you can identify most of the cats in it! Mom can't figure out why I stick my leg up in the air like this (and keep it there) while I lean over and wash my tail. What a silly question. If she had a tail, she'd know why! Well, Mom made some English Muffin Bread, Brownies and roasted another chicken in the hot-as-hell box again today. Can you tell Mr Karate was here for dinner? Mom will use the leftover chicken to make a Cobb Salad for lunches this week. Mom also worked on a few Gizzy Quilts, and as most of you know, started a cooking blog of her own. Heh. I got tired of her hogging mine. And YES! I got some of that nice chicken! Mom dropped some on the floor, and I scarfed it right up! It isn't as good as beef, but it works for me! Look! My friend Poppy Q gave me this award! I am a Bloggin' Princess! I am giving the award to my woofie cousins Lucky & Roxy for their great work on the Road Trip a couple of weeks ago, to my pals Persephone and Daisy Mae Maus, because they are both very good friends! I told Mom to stop hogging my blog with her cooking stuff. I told her to get her own blog! You know what? She did. She even put a special recipe on it that anybody (not any-cat) can make. She says this recipe is easy to make (yeah yeah sure, she says that about -everything-) and makes excellent gifts. 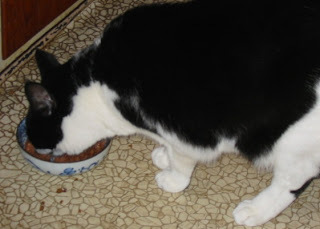 So from now on, you can go see Mom's blog for the Feed Me! Fridays. When it's cold and windy out, like it has been this weekend, Mom finds something to cook in the hot-as-hell box. She says it heats up the house and it smells good. 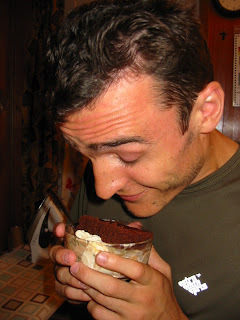 Usually it's brownies for Mr Karate. After she came back from hunting at the grocery store (she hardly bought any BEEF at all), she heated up the hot-as-hell box and beheaded (and be-bottomed, I suppose) four nice big fat red bell peppers, took out the stems and the insides, and put them under the broiler in the hot-as-hell box to "roast." Now, Mom may call it "roasting", but let me tell you, all that happened in there was the peppers turned BLACK! That's called BURNING, in my book. Anyway, when they were all black, she fished them out with the tongs, put them in a bowl and covered the bowl with plastic wrap. Then she just let them sit there. Next she roasted a real whole live dead chicken! That sure did smell good. I made sure to get some little bits of -that- I can tell you! While the chicken was cooking, she peeled apples and cut them up and put them in a baking dish. She sprinkled brown dirt all over them, and then some different kinds of brown dirt she keeps in jars in the cupboard. She called them Cinnamon, Nutmeg and Cloves. When the chicken came out of the hot-as-hell box, the apple slices went in. Mom then had the chicken for dinner, along with some stupid potatoes and some disgusting green rabbit food. Next thing I know, she's got a really cool bag of tiny red balls and she won't let me play with them. I know they're balls, because she dropped one and it bounced and rolled under the table. So she dumps these little balls in a big bowl and adds more of that stupid brown dirt, then some of those special dirts, like she added to the apples, then she scraped the skin off an orange and stuck that in, and then she added the juice from the orange, and then she put some of that really really totally disgusting stinky stuff she calls "Gran Mar-nee-ay" in it and then she added some golden raisins and some regular raisins and mixed it all up. So when the apple slices came out of the hot-as-hell box came out of the oven, the dish with the little red balls went in. While the red balls were in the oven, she peeled black skin from the red peppers. Then she cleaned everything up. At the top are the peppers, now "roasted." 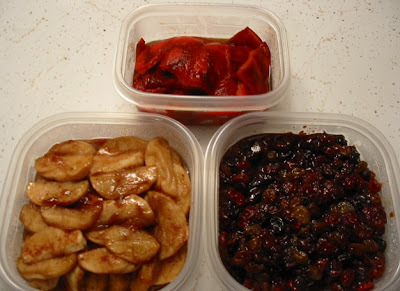 On the bottom are the apple slices and the red balls Mom called "cranberries." On Turkey Day, she will heat up the cranberries, and then add the apple slices, and then heat it all up, then eat it with the big bird. Seems like an awful lot of trouble. I have been asked to provide the recipe for the Potato & Roasted Red Pepper Soup Mom will serve on Thanksgiving. There's a neat story behind it, so I will let her tell it: In early 2001, I sent an email to cookbook author Rick Rodgers lamenting the problems of cooking for one after my son went away to college. He was gracious enough to reply with some suggestions. Later that year, my sister and I went out for dinner together at a fussy restaurant. She ordered a roasted red pepper soup. It looked pretty good. I thought it would be easy to make and emailed Rick asking if he knew where I could find a recipe to get started. To my surprise, he replied the next day with a recipe. I read it and immediately drove to the grocery store to get the ingredients and make the soup. It was great, and I took this picture, and emailed Rick, telling him the soup was fabulous. He replied, telling me he would be testing the recipe himself for his then upcoming book "The Carefee Cook." The final recipe includes sausage, but I still prefer the original. Rick says: “Don't use bottled red peppers, as they are usually packed in vinegar, and that will make the soup too strong, especially with the balsamic on top. “Here's an easy way to roast peppers. I broil them, which is much easier than any other way and you can do a lot at a time. The trick is to cut the peppers into large, long strips. Cut off the top lid and bottom inch of the peppers--set these two pieces aside, but poke the stem out of the top lid. Cut the pepper vertically down the side and open up into a long strip. Cut out the ribs and seeds (the strips make this chore easier, too). You can do 3 or 4 peppers in no time this way. Now lay the strips, tops, and bottoms on a broiler rack and broil in a preheated broiler until the peppers turn the familiar black…" Put the peppers in a bowl and cover tightly with plastic wrap, let cool. When cool enough to handle, simply peel the skins away. You can find the recipe here, on Rick's website: Potato & Roasted Red Pepper Soup. Mom says it is very easy to make. It is cold and windy outside today. 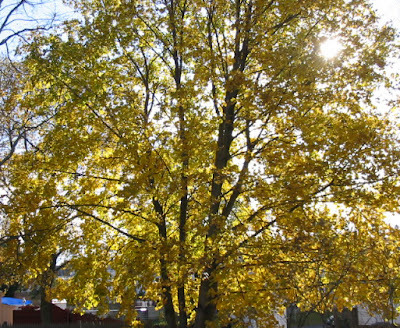 But the sun is shining, and when it shines through the yellow leaves of this tree, it is very pretty. So Mom took a picture. But look what she saw when she turned to go back into the house: This is one of the parsley plants from her garden this summer. Even though we have had a frost, this plant has nice fresh green leaves! Mom will pick some to use this week. 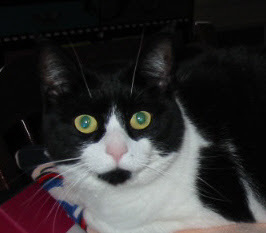 Mom did the WW thing this morning again (Jan, check here) and she is back on track. Here I am pestering Mom. She was trying to cut this fabric for a Gizzy quilt, but I want her to pet me. 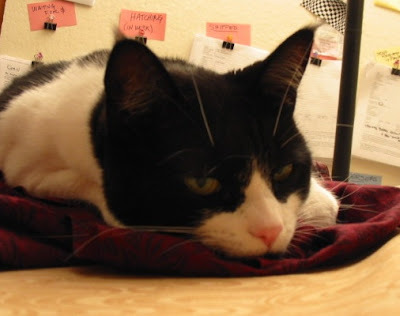 Now that I am the Only Cat, things have changed, and I want to tell you all about it. Gizzy used to wake Mom up in the morning. I don't. I sleep on my nifty bed on the blue recliner, just outside Mom's room. When I hear the squawk box go off, I go jump on her bed so she can pet me. She usually hits the squawk box to make it be quiet, then she gives me scritches. She is under the blankets, so I don't have to worry she will try to pick me up. I move all around so she can give me all the scritches I want wherever I want them. Sometimes I will flop down on the bed and lean up against her, but she can't get me, so it's OK. Sometimes I even lean on her, and once I even lay down on her belly. But I didn't stay long. I do not sleep on her bed at night. I only sleep on her bed during the day when she is gone. When she gets up, she turns on the computer and then goes to the litterbox room. After that she gets my food ready. Then she gets in the rainbox. I don't hang around waiting, like Gizzy did. I occasionally jump up onto the counter while she makes her lunch and gets her breakfast ready. Sometimes I meow to let her know I want more scritches. Sometimes I get on the table while she eats breakfast. But I don't drink her milk, the way Jasmine used to. When she leaves for day hunting, I am usually in my favorite spot in the cat hammock, watching as she gets in the metal macheen and goes away. Gizzy used to know when she would be coming home from day hunting and wait on the back of the recliner, watching for her metal macheen to come into the driveway. Then he would meet her at the door when she came in. I don't do that. She calls me, but that just lets me know she's home. She gets the mail, turns the computer on, closes the window sticks and puts her coat away. By that time I have done my stretches. She gets my food ready, and then I have dinner. After she makes the bubbles with the pots and pans, she goes in the sewing room. I usually make sure she gives me plenty of scritches and pets before I let her get any sewing done. Someday she'll figure out that Only Cat also means Top Cat! OK! Finally, Mom's got a BEEF recipe for all us carnivores. This is a favorite recipe around here. Mom's had it for like a squillion years. It's one of those "Beef, it's what's for dinner" recipes. It is easy, and good, and Mr Karate LOVES it! Cut beef lengthwise into 2 strips; slice across the grain into 1/8-inch thick strips. Combine soy sauce, 2 tsp oil, sugar and cornstarch; stir into strips. Heat remaining 2 tsp oil in large skillet over medium-high heat. Add garlic, ginger and pepper pods; cook 30 seconds. Add bell pepper and corn; stir fry 11/2 minutes. Add pea pods; stir fry 30 seconds. Remove vegetables from the skillet; reserve. Stir-fry beef strips (half at a time) 2 - 3 minutes. Return vegetables and snow peas to skillet and heat through. Serve over hot cooked white rice. Mom loves Project Runway. She has been watching since Season One, way before it became a big hit and everybody got on the bandwagon. I would love to be on Project Runway. But they wouldn't take me. Here are 13 reasons why I think I should have been on Project Runway. 1. I am always perfectly attired: Black and White is a timeless, classic combination. 3. I know how to strike a pose. 4. My claws are better than scissors for cutting. 5. I may be a cat, but I am never catty. 6. The camera loves me. 9. I would never get into a fight with Nina Garcia. 10. I know what a sewing machine is. All this thinking of Gizzy made Mom and me a little nostalgic. So today we decided to do a two-fer. 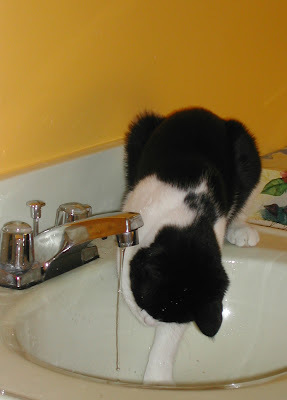 Here are two pictures, one of Gizzy drinking water from the faucet (yes it is dripping off his head) and another of me trying to copy him. 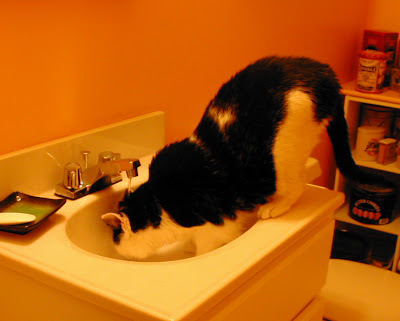 I didn't stick my head under the running water, just my paw. This is a picture of my bestest pal Gizzy. This picture was taken four years ago, when he was 11 years old. Most of you know that Gizzy went to the Rainbow Bridge this past April. He was wonderful, and Mom and I loved him a lot. Like Monty Q, he used to want to go outside all the time. 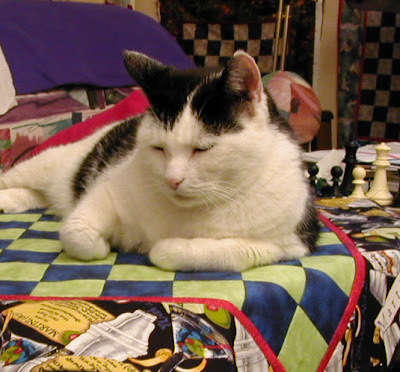 Anyway, before she made Gizzy Quilts, Mom made a bunch of Quilted Chessboards. 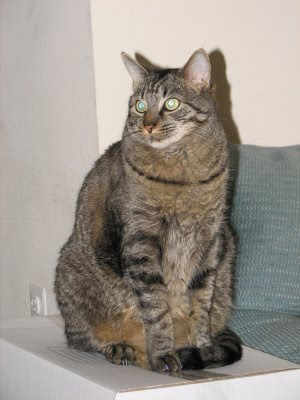 Here is a picture of one of them, named "Martini." The chessboards are made of cotton, but have a filling of denim, to keep them stiff. They are "regulation" size, which means the individual squares are 2-1/4" and will work with most standard sized Chess pieces. This chessboard is set up with a puzzle, and the only clue is "White forces Mate." Now, I don't know what that means, but if you do, you can solve the puzzle. Mom just rebuilt her computer again (don't ask) and she -finally- got all her pictures back on it, so I can finally post today. I was in a missing-Gizzy mood, so that's why we have this nice picture of Gizzy for you tonight. Mom doesn't do easy. Yesterday she went to the WW meeting, then went food hunting, then Mr Karate came over with a present for her. Then they had lunch. He went to his cello lesson and she went down to the basement and moved junk around. She has been trying to organize the stuff she has collected, get rid of stuff she doesn't need and make it look better. Mr Karate came back after his cello lesson and practiced, but Mom went back down there to move more stuff around. When she came upstairs, Mr Karate was hungry again, so Mom made him another sandwich (tuna - yech!) and then they watched Ratatouille. It was really good. Here's the present Mr Karate brought Mom. Actually it isn't a present, it belongs to Mr Karate. His friend, R, is moving from Boston to Beezer's town of San Francisco to work for Cisco. 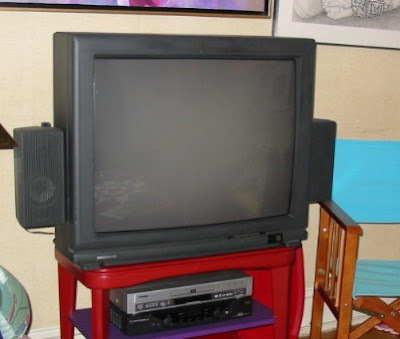 She decided not to take the TV and gave it to Mr Karate to lend to Mom. So they were able to watch the movie on this big tv instead of the tiny one in the sewing room. I slept on the bed, on my freshly washed Gizzy Quilt. - I - know how to do Easy! The guys named Pat aren't playing this week, so Mom will watch all of "The Next Iron Chef" until the final one later tonight. She can't wait to see which guy will be the next Iron Chef. Oh yeah... Angus; Mom does the WW thing too, and she says yup, those brownies have WAY too many points for her to eat either. Mom had a pretty lousy day at her day hunting job yesterday. So I'm gonna stick close to her today and try to cheer her up. 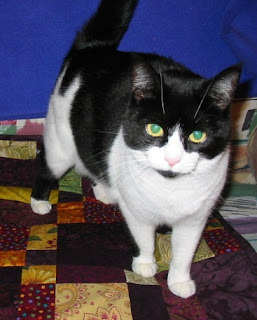 She's filled all the orders for Gizzy quilts, and she wants to make some to have ready to sell, but she doesn't know what colors cats might like, so that's why we have the poll in my sidebar. Mom figures she could probably make 6 quilts that could be delivered before Christymas. So if you are interested, shoot me an email at darlingmillie AT gmail DOT com. Or just visit the website. Be sure to tell us what colors you would like, and if you want a Gizzy quilt to match your furs. Scroll down for newer posts. Have you seen this cat? SEND HIM HOME! Monty Q, wherever you are, GO HOME! My sweetie is missing! home! I guess he slipped out when the Pizza guy left the door open too long. Silly Monty! He spent the night on a neighbor's porch chair, safe and sound. Thank goodness! I feel -so- much better! Mr Karate says these are really good with vanilla ice cream. Or with whipped cream. Or just a cold glass of milk. A pan of these rarely lasts more than 24 hours at our house. Mr Karate says these are the bestest brownies in the whole wide world. Mom got the recipe from her Mom's Betty Crocker 1953 Red and White Cookbook. Mom likes brownies with nuts, but Mr Karate doesn't. Since there is no beef in them, I don't like them at all. Spread in a well-greased 8” square pan. Bake 30 minutes, until top has a dull crust. A slight imprint will be left when top is touched lightly with fingertip. Cool slightly, then cut into squares. This recipe doubles easily: put in a 13 x 9 x 2” pan and bake for the same amount of time. Mom missed me so much, she bought me a PRESENT! She says it's a heated cat cup. Now, don't get me wrong or anything, but this doesn't look like any cup I have ever seen. 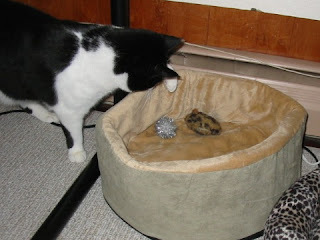 She tried to lure me into it by putting my sparkly ball and Nip-filled mink mousie in it, but I'm smarter than that. Yup. I ain't gettin' in that silly thing. I'm just fine right here, thank you very much. 7. My special spot in the window in the studio where I can watch the little sticky people next door run around and scream. 13. Getting scritches behind my ears. Did I say how much I missed those? 'Course now that I am home, I miss Monty Q. Maybe HE can come over and try out the heated cat cup thing. Dunno if he'd fit, though. Bet he could squeeze himself into it. I'm home! I'm home! I'm home! I was so eager to get home! I am so glad the train ran all night and all day! I got home before Mom got back from day hunting. She came in the door, and I was sitting in the big blue chair. I got lots and lots of pets and scritches. I purred and purred, I was so happy. I even rubbed against Mom's arm a bit, and then came back to get more scritches on my cheeks. Oh, I like those so much! Mom was so happy to see me, she opened up a can of STINKY GOODNESS! As you can see, I dove right in. Later I had some Beef Temptations, and even my crunchies. I will spend the day in my cat hammock napping and looking out at the crappy November weather in New Hampster: cold, grey, rainy. Mom made quilts. I don't think I should be surprised. This pretty flowery one is for some girl kitties in Kansas. And you have probably seen this very Skinny Gizzy quilt that ended up at Parker's house. 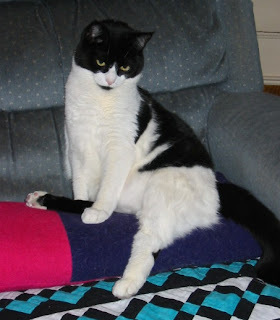 (I teleported back one night to give it the QA check, as you can see) Click here to see Puff showing off the quilt. This bright one is flying to its cat in Catifornia today. You should check Jan's Funny Farm today and tomorrow. I think she's got something to show off. Bounce showed off his Gizzy Quilt yesterday. Lucy and Trixie also got quilts a few weeks ago. 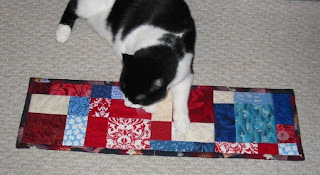 Mom has also updated the slide show of -all- the Gizzy Quilts over at the Bizzy for Gizzy blog. The slide show starts with Monty's quilt, and then goes through all of the ones Mom has made, in the order she made them. Then it starts at the first quilt again, and goes round and round. You can also see Rudy showing off the Halloween Quilt that mysteriously landed at his house. He has apparently decided that since the quilt matches his furs, it is HIS quilt. You can also see Jan's Funny Farm showing off the quilt they got recently. I'll be home before Mom gets back from work today. I can't wait! I can't wait! I can't wait! You all know that I am not a Mancat. I am a Ladycat. 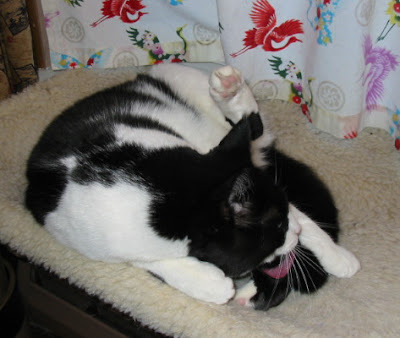 I want to celebrate two Mancats here today on Mancat Monday. First, Luxor. 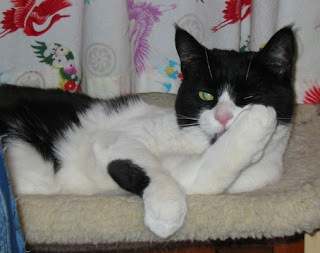 It's not everycat who would put up with having his home invaded by 22 or 28 cats and a couple of dogs he's never met. He was a complete gentleman and a wonderful host on our road trip to visit him. Lux, for your incredible cool and patience, I salute you! Next, my sweetheart Monty Q. (I'm biased, so what?) 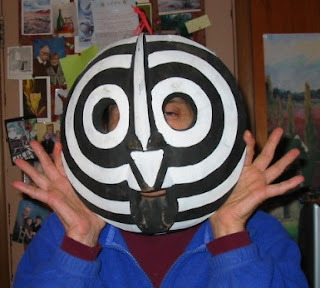 Monty put together a terrific itinerary of stuff to do and visit when we got to his place. He also shared driving responsibilities, and spent a great deal of time entertaining us with his singing. And when I got lonely and homesick, he immediately made arrangements to help get me home. Monty, thanks for being there for me! I shall always remember this road trip. It was the most fun! I met lots of great friends, ate lots of great food, saw wonderful new places and had a fabulous time. I am eager to get home and rest, but I hope we can all have another road trip again someday. We are visiting Tara and Kavan today. They have a lovely yard. I got to watch hummingbirds and climb the tree. We will also visit Miss Peach, who has organized hot air balloon rides for all of us. We also had a terrific visit with DKM & the fluffies... that massage was just what I needed to renew my spirits. That barbeque with Michael, well, I've never had such fabulous food! I'm impressed! This has been the most incredible week of my life. I have had so much fun with my friends, and seen so many new places, and tried new foods. It has been magical, the I cannot thank my friends enough for their generous hospitality! But as you all know, I am homesick. My dear Monty Q has organized a train to bring us back home. It is a really fast train. We will put the big red bus on it, and bring all the cats back home. In Florida, we will put the cars on the train, and head back to the cold Northeast. We will spend Monday speeding across the country, and I will be home sometime on Tuesday! But you know what Monty Q did just for me? He made sure the train had a GIGANTIC wide screen plasma TV so Roxy, Lucky and I could watch The Big Game today between The Guys Named Pat and those horseshoe guys, even though the Guys Named Pat are not Monty's favorite team. I have been having a lot of fun on this road trip, traveling all around the country visiting friends, eating new foods and seeing the sights. I have enjoyed racing with Sammy, Monty's singing, driving with Dragonheart, visiting San Francisco with Beezer, eating lizard stew with Daisy and watching Lucky and Lux find each other. I really want to see Napa and ride in a hot air balloon. But I am homesick. I miss my Mom. I miss her scritches. I miss watching her make Gizzy quilts. I miss my own bed. It's kinda noisy on the road trip, and my house is nice and quiet. After the hot air balloon ride, can we go home now? I hope you all have been having fun reading about the Road Trip! I was trying to keep my absence a secret from Mom! You all know I am not good at keeping secrets. Like Monty's karaoke machine... You should see what the Sammy Meezer found down in the luggage compartment... He was down there with Abby "investigatin." Oops, there I go again. Go to Beezer's blog to find out what we have been up to lately. He's now my hero -- you're just gonna have to go over and find out why. The answer is one word: BEEF! Mom has decided to hijack my blog again in my absence and post another recipe. Well I never! This is another vegetarian pasta recipe. It's a little bit spicy, but not too much. Mom says to make it -exactly- the way it is written or you'll lose the something that makes it special. This is another recipe that takes about 30 minutes. By the way, Mom is from New Hampster, so what she thinks is "a little bit spicy" will probably be "not spicy enough" for some beans in the Southwest. Start heating a large pot of water to boiling for the pasta. In a small bowl, combine the raisins and ½ cup of hot water. Let stand until the raisins have softened, about 10 minutes. Meanwhile, in a small dry skillet, cook the pine nuts over low heat until lightly toasted, stirring frequently, about 4 minutes. Remove from heat. In a large nonstick skillet, heat the oil until hot but not smoking over low heat. Add the cauliflower and cook, stirring frequently, until the cauliflower is golden, about 5 minutes. Add the garlic and cook, stirring frequently, until the garlic is lightly golden, about 3 minutes. Add the raisins and their soaking liquid, tomatoes, tomato sauce, salt, pepper flakes, and ginger, breaking up the tomatoes with the back of a spoon. Cook until the cauliflower is tender and the sauce is slightly thickened, about 4 minutes longer. Meanwhile, cook the penne in the boiling water until just tender. Drain well. Transfer the cauliflower mixture to a large bowl, add the penne and parsley, and toss to combine. Spoon the penne mixture into 4 shallow bowls, sprinkle with the pine nuts, and serve. this recipe is from a book called "Great-Taste Low-Fat Pasta"
Oh Dear! I am -SO- late! Omigoodness.... I can't believe the day has slipped by like this! We Road Trippers are here at Lux's place in New Mexico. After five hectic, fun-filled days traveling down from New Hampster with an every growing group of pals, today was just a day to rest. Lucky and Luxor only had eyes for each other, and the rest of us decided to leave them to it. I spent the day relaxing day with my own sweetie, Monty Q. We found a nice quiet place to sit in the sun and enjoy the scenery and smell the smells. It's a lot warmer in New Mexico than it is in New Hampster this time of year. Mont's karaoke machine has gone missing. He's pretty broken up about it. Just like the mach... Oops. Gotta go now.